Cheap Photo (Paper) Insert Calculators in Bulk. Promotional. Custom Full Color Inserts. Budget Prices in USA and Canada. 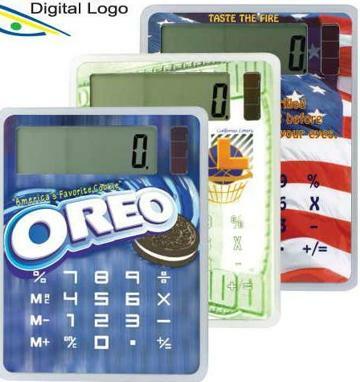 Our photo insert calculators are unique solar calculators that allow you to imprint your promotional logo and message in full color over a wide area! Lowest prices in USA and Canada for wholesale photo insert calculators. American clients pay no taxes. Free artwork design. You may buy blank (not imprinted) calculators for $2.35 each (minimum quantity: 100), and personalize them with your own paper insert. We also supply paper insert calculators with longer overseas production (10 weeks) at a lower cost: please contact us. The unit prices below include your full color imprint and are are valid for our standard 5-day production. You may buy blank (not imprinted) calculators for $2.35 each (minimum quantity: 100) and personalize them yourself. Setup Charge: $45.00 for full color imprint. There is no Setup Charge for blank Paper Insert Calculators. Production Time: 1-3 days after artwork approval. Blank Paper Insert Calculators ship next day. Color: Your custom full color imprint (unlimited number of imprint colors). One Setup Charge of $45.00 covers all colors. Packaging: Individual White Box; 200 calculators per carton of 23 lbs.